Be serious, but, by golly, be silly. It's good for the soul to just let go and be childish and happy-for-no-reason sometimes. At least, it's good for my soul. I guess that's really all I can speak for, but I never want to lose my playful side. I think it keeps us young, happy, and able to handle all of life's curve-balls. That looked really nice and the photo shoot was great. your grandmother sounds like quite a lady! mine used to dress in a clown outfit and show up on her friends's doorsteps for their birthdays. a little craziness, and a lot of laughter is great for keeping one young. I couldn't agree with your stance in silly more, Katie! I love that my mom is zany and weird, and I'm so thankful it rubbed off on me :). She turns 60 this year (and I 30), and we both look and feel a whole lot younger! Hehe :). Always have fun, I say! You look stunning, by the way! I found a pair of fleece leggings at TJ Maxx that I'm now kicking myself for not picking up! 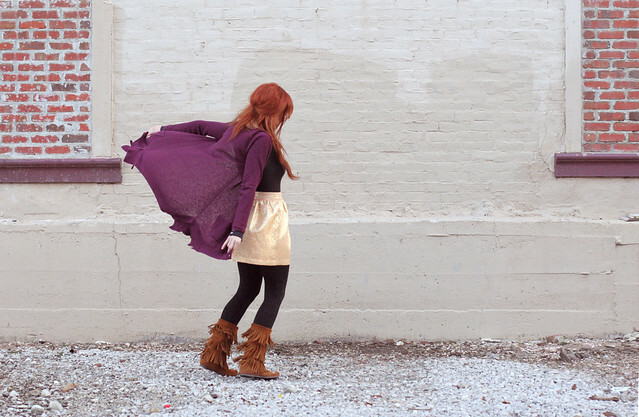 dresses always look so cute paired with moccasins :) and being silly may just be the spice of life. Love these photos. Loved the message too. My motto is play every single day. Love the outfit. Oh and the little skunk is so cute. lovley! or in my language "divno"! Love the colours, great outfit. This post is just so beautiful and shows your inner character. Thanks for sharing your sweet style and your sweet heart. You are a blessings! And your skirt is adorable. My grandparents are like that! They're always doing silly things to make us laugh, still to this day. We all love it! Your outfit is adorable. I love your skirt. And that pin is just too cute. So cute! Love the skirt. 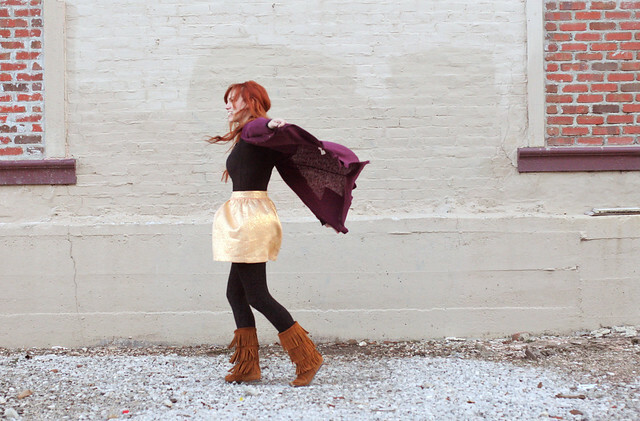 Love your sparkly skirt and fleecy leggings are such a great idea, wouldn't be without them! 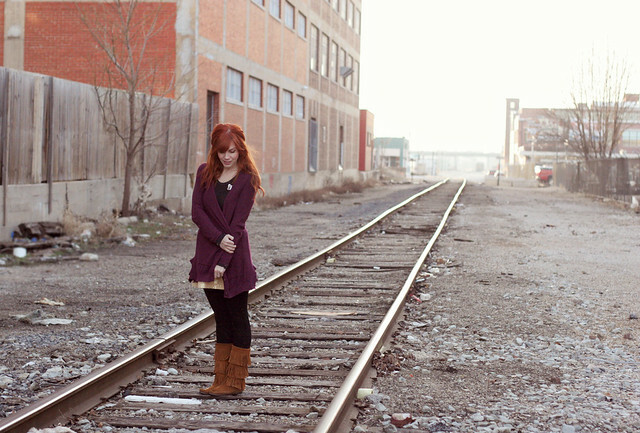 These photos are adorable! I love the shiny skirt especially, it looks great on you! how fun! i agree, i hope i never lose my silly side! 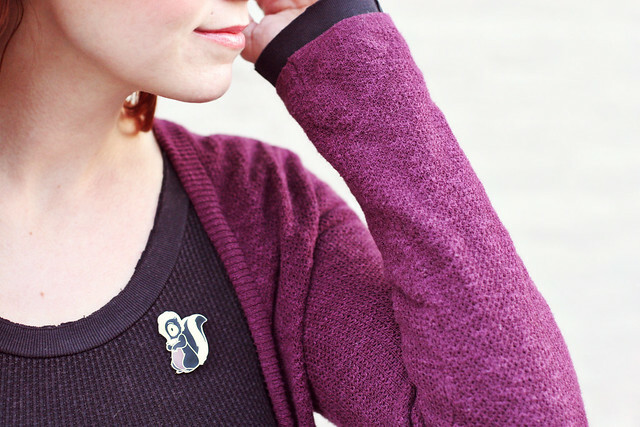 i love that skunk pin! I want some of those boots!! You're so cute! Lovely outfit. And I agree - I need to keep my playful side too! You look so good in that outfit, it´s so good! I agree, I should take your advice and just be a child sometimes.. I know it would be good for me! You're so pretty. This skirt looks awesome on you, very very cute! I totally agree, be silly sometimes! by the way I'm going to have "shiny happy people" stuck in my head for days! My husband and I always talk about the mischief we are going to make when we are older. Lots of people fear getting older, but I know my husband and I are going to have a grand time together. Love the skirt - so pretty! My grandpa is just as playful, and it's wonderful. I, too, hope to be silly as I grow old.